China says its land reclamation work in the South China Sea is "totally justifiable" as it has "sovereignty" over the area. Its foreign affairs ministry spokesman Hua Chunying was responding to a BBC report which documented China's construction work in disputed waters. The Philippines has accused China of illegal building in the area. China is locked in a dispute with several countries over maritime claims in the South China Sea. 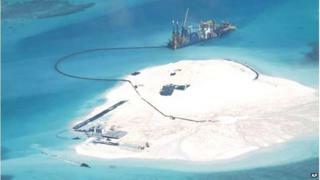 The BBC report by Rupert Wingfield-Hayes said China was building new islands on five different reefs. He and his team documented Chinese work to dredge tonnes of rock and sand from the sea floor to pump into Johnson South reef in the Spratly islands, which are also claimed by Manila. At a daily press briefing on Tuesday, Ms Hua was asked by the BBC why China was reclaiming land. She responded: "We have answered this question many times before, and I suppose you must be fully aware of China's position." Using the Chinese name for the Spratly islands, she added: "China asserts indisputable sovereignty over the Nansha Islands and the adjacent waters, and China's activities on relevant islands and reefs of the Nansha Islands fall entirely within China's sovereignty and are totally justifiable." Asked whether the reclamation was for commercial or military use, Ms Hua replied that it was "mainly for the purpose of improving the working and living conditions of people stationed on these islands". When the BBC pointed out that the land masses were new, Ms Hua declined to elaborate further, saying: "I have already answered your question." The works appear to have been going on for months. In May the Philippines released photos appearing to show Chinese land reclamation on Johnson South reef, saying China appeared to be building an airstrip. Aside from the Philippines, Vietnam, Brunei, Malaysia and Taiwan also have competing claims with China over various islands, reefs and shoals in the region. Separately, relations between China and Japan are also currently under strain over a territorial row involving islands in the East China Sea. Why the fuss about the South China Sea?